Announced live on stage not long ago at Celebration in Brisbane, Isagenix has now launched three new products in Australia and we’re excited to share. The new additions include an all-new Chocolate Mint IsaLean Shake, E-Shots in Lemon Lime, and Thai Sweet Chilli Harvest Thins. All three products are now available in your back office, so do your taste buds a favour by trying them out today! The flavour-packed Chocolate Mint IsaLean Shake took Australia by storm during its limited seasonal release in May of 2016. In fact, in the two years since, Isagenix received so many requests they had no choice but to bring it back as a permanent fixture in their Australia lineup, and we’re glad they did! With the same premium whey and nutritional value as every other wonderful IsaLean Shake flavour, it’s a deliciously healthy meal replacement option. *Also sold separately in your back office if you simply want to try it out. As one of Isagenix’s top-selling products in Australia and throughout the world, the e+ Energy Shot has been an in-demand product from day one. In addition to boosting energy, fueling athletic performance, and combating fatigue, this top-selling energy shot is also Informed-Sport Certified and available in an all-new tasty Lemon Lime flavour. While the flavour is new, the science behind the magic of the e+ Energy Shot hasn’t changed a bit. It still contains a scientifically backed combination of adaptogens and all-natural plant-based caffeine to help boost your physical performance and mental alertness. Love Harvest Thins but wish they were a little spiced up? Well, now they are! Crunchy, savoury, and possessing a healthy dose of Thai chiles along with a hint of sweetness, the all new Harvest Thins Thai Sweet Chilli will give your taste buds a real treat. Best of all, like other Harvest Thins flavours, these new flavour-packed squares are dairy free and completely plant-based. That’s right; if dairy is no friend of yours and you’re searching for a flavourful, highly nutritious Cleanse Day and Shake Day approved snack option, get these new tasty and nutritious snacks in your back office today. With only 100 calories and an impressive 11 grams of protein per serving, Harvest Thins Thai Sweet Chilli are the smart potato chip alternative. *Also sold separately in your back office if you simply want to try them out. As you can see, all three of these new product flavours are designed to take your taste buds and enjoyment of Isagenix products to another level. 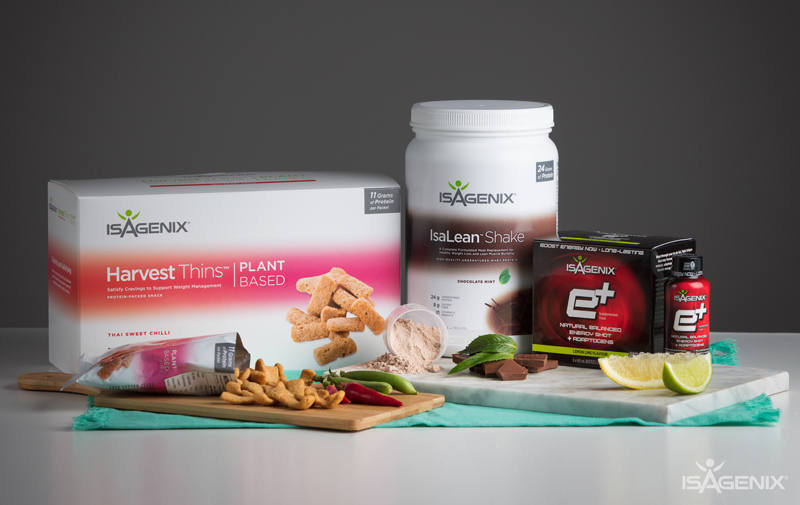 Mix things up and get the most out of Isagenix by checking them out today!